This fellow stopped by one evening a few weeks ago. 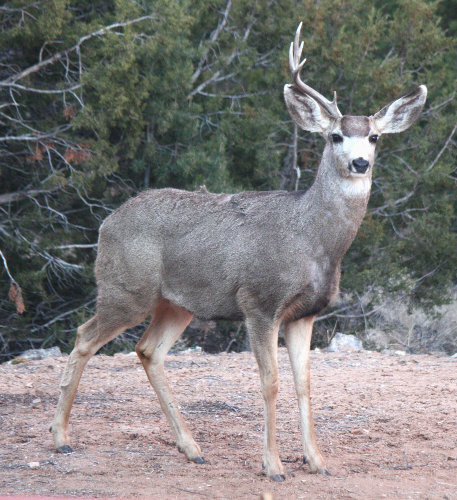 He'd lost one of his antlers (I'd love to find it in the yard, but no luck so far). He wasn't hungry; just wandering, maybe looking for a place to bed down. He didn't seem to mind posing for the camera. Eventually he wandered down the hill a bit, and a friend joined him. 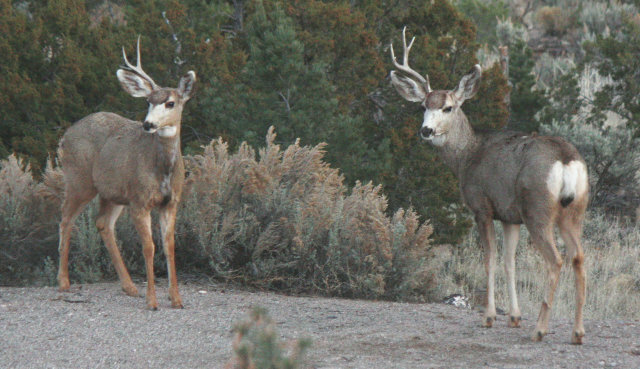 I guess losing one antler at a time isn't all that uncommon for mule deer, though it was the first time I'd seen it. I wonder if their heads feel unbalanced. Meanwhile, spring has really sprung -- I put a hummingbird feeder out yesterday, and today we got our first customer, a male broad-tailed hummer who seemed quite happy with the fare here. I hope he stays around!